Nuzzel aggregates links shared by people you follow on Twitter over a specific period of time. Tweets containing the same link shared by multiple people are coalesced into a single article recommendation in the app, which displays the title, a brief excerpt, the source, and a count with the number of “friends” who shared the story alongside their profile pictures. The useful aspect of this is the way Nuzzel lets you adjust time filters: you can find the most shared links for the past 1–8 hours, the past day, a specific day in past week, or links from last week. By hitting the date button in the upper right corner, you can change the date filter at any time and “travel back” into, say, Twitter from two days ago and see what your timeline was talking about without scrolling long lists of tweets. For the past two months, I’ve been using Nuzzel almost religiously, promoting it to my Home screen and turning on notifications for articles shared by my friends on Twitter. The idea behind the app resonates with me: I like to read every single tweet in my timeline, and I’m fairly proud of the list of people I’m following that I have “curated” over the years. I don’t like to miss any tweet because, for the past five years, I’ve discovered news, apps, and interesting links thanks to Twitter. And lately, with MacStories Weekly, the ability to find links and cool stuff with Twitter is essential to my workflow. I’ve been checking Nuzzel in the morning, before bed, and occasionally in the afternoon after coming back home from shopping for our new house at IKEA. The main view of the app – News From Your Friends – facilitates this reading behavior thanks to a handy button in the top right that lets you load links shared in the past 1 to 24 hours, up until any day of the past week. You can use Nuzzel to catch up on Twitter links after a few days of absence, or you can read like I’ve been reading – as a daily summary and regular afternoon check-in. And because your friends’ profile pictures are displayed alongside links, you can even see how people have actually been sharing links and what comments they added. Today, the social news reader built by Jonathan Abrams and his team comes to the iPad with an interface that’s been adapted to the larger display to show more links, visual previews, and shortcuts to friend feeds right alongside articles. “We wanted to offer a few things that we had room for on our web site but not in the iPhone app, since we have more room to play with on the iPad”, Abrams told me, and the end result is my favorite version of Nuzzel yet. When you launch Nuzzel on the iPad, you’ll see a home page with popular links from your friends from the past x hours with a carousel of most shared articles at the top. Below, you’ll find more links in a regular list with a sidebar that you can use to open friend feeds directly. The larger screen of the iPad has allowed the Nuzzel team to pack in more information without having to tap on the hamburger menu in the top left: tabs enable you to switch from news from your friends to news from friends of friends (my favorite way to discover new articles), news you may have missed, and stories you’ve read. 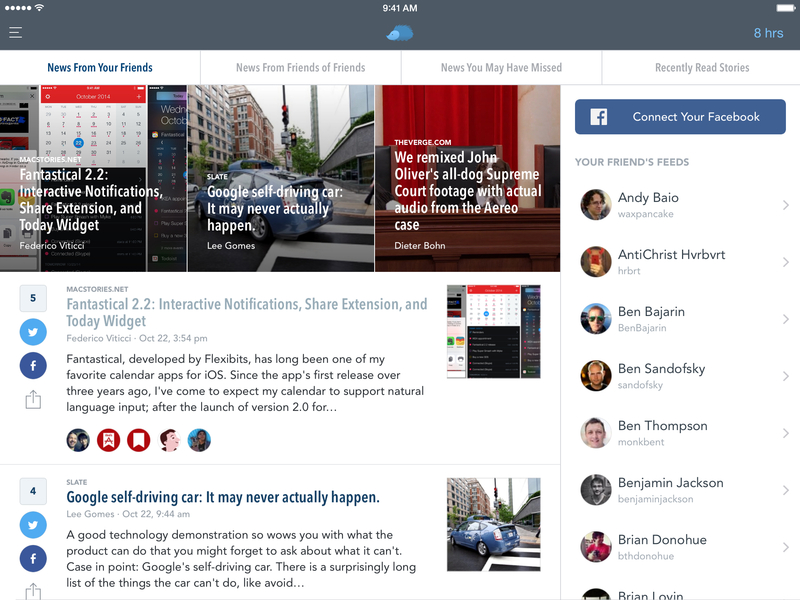 Nuzzel for iPad is still the same Nuzzel, only on a bigger screen – and that’s exactly why I like it. Being able to see more links at once and the friend feed sidebar in landscape make me tap more items and follow different stories – I particularly appreciate the addition of a gallery of articles at the top, and I miss this feature on the iPhone now. 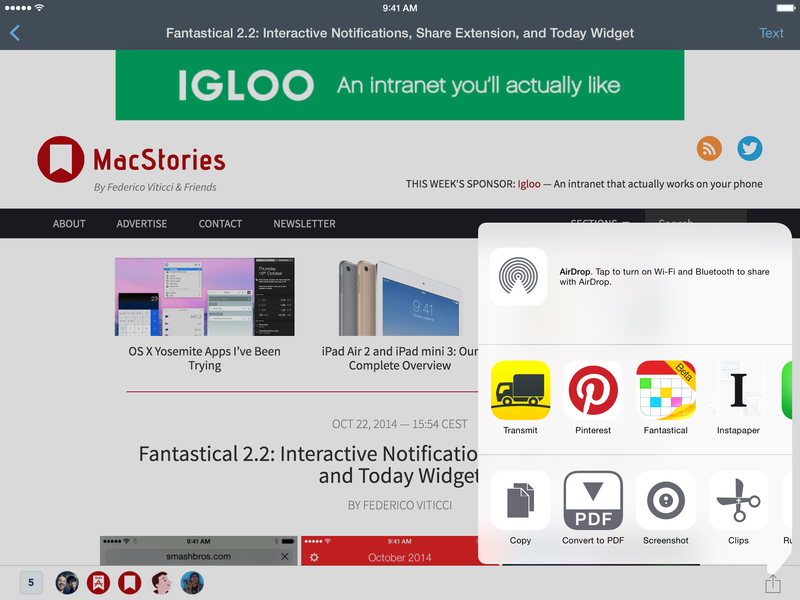 With iOS 8, Nuzzel has officially gained support for action and share extensions, but its implementation is still hindered by the decision to obfuscate source URLs with a Nuzzel short link. You can launch extensions for articles – I was able to quickly capture articles in Drafts and Fantastical from Nuzzel, which was seamless and fast – but you’ll end up saving nzzl.me short links instead of the original URLs, which may be an issue for apps like Pinner or Instapaper. It’s great that I can run extensions from Nuzzel, but everything would be so much better without short links. Nuzzel has also brought other iOS 8 features with this update: you can interact with notifications to instantly tweet an article, and you can add a widget to your Notification Center to see popular articles. I liked the idea of having a Nuzzel widget initially, but I think that, between thumbnails and profile pictures, it takes up too much space in the Today view. When I first heard about Nuzzel, I thought it was nothing more than a feature Twitter would eventually add to their apps and website. And maybe someday they will, but that day hasn’t come yet and Nuzzel is a great product as it stands now. I’ve been using Nuzzel for iPhone every day, and since getting the iPad app I’ve noticed that I prefer to catch up on news and discover links on the larger screen where all my other work-related apps are. Nuzzel still has some inconsistencies and oddities to fully figure out (namely, source URLs), but the iOS app is one of my must-haves for news on both the iPhone and iPad. 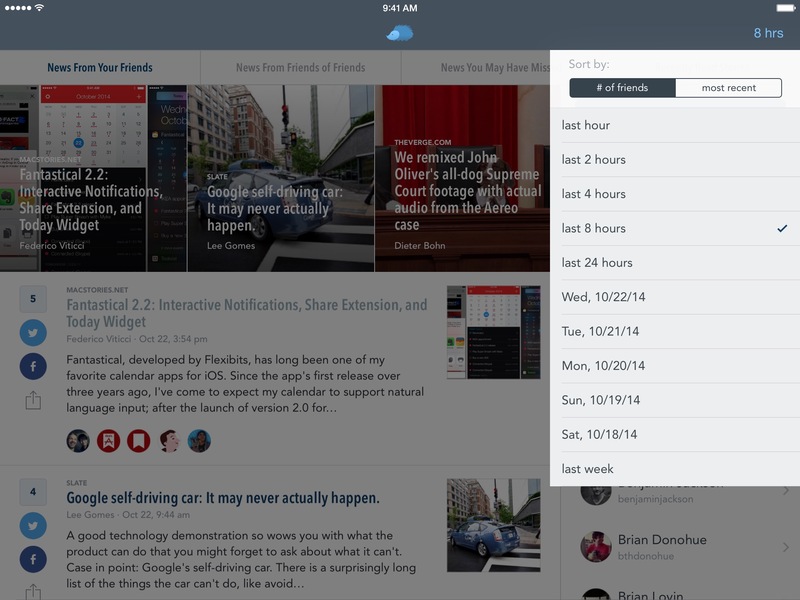 Nuzzel 1.2 is available on the App Store.